The endogenous cannabinoid 2-arachidonoylglycerol (2-AG) plays an important role in a variety of physiologic processes, but its rapid breakdown by monoacylglycerol lipase (MAGL) results in short-lived actions. Initial MAGL inhibitors were limited by poor selectivity and low potency. In this study, we tested JZL184 [4-nitrophenyl 4-[bis(2H-1,3-benzodioxol-5-yl)(hydroxy)methyl]piperidine-1-carboxylate] and MJN110 [2,5-dioxopyrrolidin-1-yl 4-(bis(4-chlorophenyl)methyl)piperazine-1-carboxylate], MAGL inhibitors that possess increased selectivity and potency, in mouse behavioral assays of neuropathic pain [chronic constriction injury (CCI) of the sciatic nerve], interoceptive cannabimimetic effects (drug-discrimination paradigm), and locomotor activity in an open field test. MJN110 (1.25 and 2.5 mg/kg) and JZL184 (16 and 40 mg/kg) significantly elevated 2-AG and decreased arachidonic acid but did not affect anandamide in whole brains. Both MAGL inhibitors significantly reduced CCI-induced mechanical allodynia with the following potencies [ED50 (95% confidence limit [CL]) values in mg/kg: MJN110 (0.43 [0.30–0.63]) > JZL184 (17.8 [11.6–27.4])] and also substituted for the potent cannabinoid receptor agonist CP55,940 [2-[(1R,2R,5R)-5-hydroxy-2-(3-hydroxypropyl)cyclohexyl]-5-(2-methyloctan-2-yl)phenol] in the drug-discrimination paradigm [ED50 (95% CL) values in mg/kg: MJN110 (0.84 [0.69–1.02]) > JZL184 (24.9 [14.6–42.5])]; however, these compounds elicited differential effects on locomotor behavior. Similar to cannabinoid 1 (CB1) receptor agonists, JZL184 produced hypomotility, whereas MJN110 increased locomotor behavior and did not produce catalepsy or hypothermia. Although both drugs substituted for CP55,940 in the drug discrimination assay, MJN110 was more potent in reversing allodynia in the CCI model than in producing CP55,940-like effects. Overall, these results suggest that MAGL inhibition may alleviate neuropathic pain, while displaying limited cannabimimetic effects compared with direct CB1 receptor agonists. Neuropathic pain is a debilitating chronic pain condition, but available pharmacotherapies lack efficacy and are associated with various adverse side effects (Nightingale, 2012). Monoacylglycerol lipase (MAGL), the major serine hydrolase responsible for degradation of the most abundant endocannabinoid in the central nervous system, 2-arachidonoylglycerol (2-AG) (Dinh et al., 2002), represents a promising target for the treatment of neuropathic pain and other pain-related therapeutic indications. MAGL inhibitors block 2-AG degradation, leading to increased levels of this endocannabinoid, and consequently, to increased signaling at cannabinoid cannabinoid 1 (CB1) and cannabinoid 2 (CB2) receptors. Initial compounds used to inhibit MAGL in whole animals, such as methylarachidonylfluorophosphonate and N-arachidonyl maleimide, have poor selectivity when administered systemically (Makara et al., 2005; Saario et al., 2005; Burston et al., 2008), which makes it difficult to discern whether the observed pharmacologic effects were due to MAGL inhibition, to off-target actions (e.g., another serine hydrolase), or to a combination of MAGL inhibition and off-target effects. Although an in vitro study showed that URB602 ([1,1′-biphenyl]-3-yl-carbamic acid cyclohexyl ester) lacks selectivity between MAGL and fatty acid amide hydrolase (FAAH) (Vandevoorde et al., 2007), in vivo studies found that intracerebral (Hohmann et al., 2005), systemic (Wiskerke et al., 2012), or intraplantar (Guindon et al., 2011) URB602 administration raises 2-AG levels but not anandamide (AEA) levels. The recent development of MAGL inhibitors with increased selectivity compared with previous compounds has provided useful tools to investigate the consequences of inhibiting this enzyme in the whole animal. Results from several preclinical studies using the first selective MAGL inhibitor, JZL184 [4-nitrophenyl 4-[bis(2H-1,3-benzodioxol-5-yl)(hydroxy)methyl]piperidine-1-carboxylate] (Long et al., 2009a), suggested that this enzyme represents a unique target to treat pain-related conditions. Acute administration of JZL184 was reported to reduce nociception in acetic acid–induced abdominal stretching, the carrageenan model of inflammatory pain, the chronic constriction injury (CCI) of the sciatic nerve model, cisplatin-induced neuropathy model, and capsaicin-induced behavioral sensitization (Kinsey et al., 2009, 2013; Long et al., 2009a; Spradley et al., 2010; Guindon et al., 2011; Ghosh et al., 2013). Importantly, JZL184 elicited a decreased spectrum of other cannabimimetic effects associated with Δ9-tetrahydrocannabinol (THC) and other CB1 receptor agonists. Although JZL184 is approximately 450-fold more selective in inhibiting MAGL than FAAH and does not alter AEA brain levels on acute administration, repeated administration of high dose produces a 2- to 3-fold increase in this endocannabinoid (Schlosburg et al., 2010). Another limitation of JZL184 is its decreased potency in inhibiting rat MAGL activity (IC50, 262 nM) compared with mouse MAGL activity (IC50, 10 nM) (Chang et al., 2012). MJN110 [2,5-dioxopyrrolidin-1-yl 4-(bis(4-chlorophenyl)methyl)piperazine-1-carboxylate], another recently developed selective MAGL inhibitor, showed markedly increased potency in rats and no significant cross-reactivity with FAAH (Niphakis et al., 2013). These compounds provide tools to compare the pharmacologic effects of structurally distinct MAGL inhibitors in preclinical animal models of pain and assays indicative of cannabimimetic activity (e.g., drug discrimination, hypothermia, catalepsy, and hypomotility). The primary purpose of the present study was to compare directly the pharmacologic effects of JZL184 and MJN110 in the CCI model of neuropathic pain, as well as in assays indicative of cannabimimetic effects. JZL184 has already been shown to reduce allodynia in the CCI model of neuropathic pain (Kinsey et al., 2009, 2013). MJN110 reduces nociception in a rat diabetic neuropathy model (Niphakis et al., 2013) but has yet to be tested in the CCI model. A major challenge in developing direct-acting CB1 receptor agonists as therapeutic agents is their cannabimimetic side effects. Although JZL184 administered in a vehicle consisting of alkamuls-620, ethanol, and saline did not elicit common cannabimimetic effects (i.e., catalepsy and hypothermia), it produced other effects (i.e., decreased locomotor activity and partial substitution for THC in the drug-discrimination paradigm) (Long et al., 2009b,c). In contrast, MJN110 remains to be assessed. Thus, the second objective of this study was to compare the cannabimimetic “side effect” profile of these drugs, with an emphasis on locomotor activity, and interoceptive effects assessed in the drug-discrimination paradigm. Additionally, we tested whether MJN110 produces other common cannabimimetic actions, including antinociception in the tail-withdrawal assay, catalepsy in the bar test, and hypothermia. Finally, we quantified whole-brain levels of 2-AG as well as arachidonic acid. Of note, MAGL serves as a major biosynthetic enzyme of arachidonic acid in the brain (Nomura et al., 2011). Because JZL184 also inhibits FAAH, we quantified brain levels of the prevalent FAAH substrates AEA and noncannabinoid fatty acid amides [i.e., palmitoylethanolamide (PEA) and oleoylethanolamide (OEA)]. Male C57BL/6J mice (The Jackson Laboratory, Bar Harbor, ME) were used in all experiments. The body mass of mice ranged from 18 to 35 g. Four to five mice were housed per cage in all experiments, except in the drug discrimination experiments, in which subjects were singly housed. Animals were maintained in a 12-hour light/dark cycle (6:00 AM on/6:00 PM off) in a temperature- (20–22°C) and humidity- (55% ± 10%) controlled Association for Assessment and Accreditation of Laboratory Animal Care International–approved facility. Animals had ad libitum access to water and food, with the exception of animals used in drug-discrimination experiments, which were food restricted to 85%–90% of free-feeding body weight. All tests were conducted during the light phase. The sample sizes selected for each treatment group in each experiment were based on previous studies from our laboratory. All animal protocols were approved by the Institutional Animal Care and Use Committee at Virginia Commonwealth University and were in accordance with the National Institutes of Health Guide for the Care and Use of Laboratory Animals. MJN110 was synthesized in the Cravatt Laboratory at the Scripps Research Institute (La Jolla, CA) as described previously (Chang et al., 2012; Niphakis et al., 2013). JZL184 (Long et al., 2009a), the CB1 receptor antagonist rimonabant (SR141716A), the CB2 receptor antagonist SR144528 [5-​(4-​chloro-​3-​methylphenyl)-​1-​[(4-​methylphenyl)methyl]-​N-​[(1S,​2S,​4R)-​1,​3,​3-​ rimethylbicyclo[2.2.1]hept-​2-​yl]-​1H-​pyrazole-​3-​carboxamide], and CP55,940 [2-[(1R,2R,5R)-5-hydroxy-2-(3-hydroxypropyl)cyclohexyl]-5-(2-methyloctan-2-yl)phenol] were obtained from the National Institute on Drug Abuse (Bethesda, MD). Drugs were dissolved in a vehicle solution consisting of a mixture of ethanol, alkamuls-620 (Sanofi-Aventis, Bridgewater, NJ), and saline (0.9% NaCl) in a 1:1:18 ratio. Each drug was given intraperitoneally, with the exception of drug discrimination studies, in which injections were given subcutaneously. All drugs were administered in a volume of 10 μl/g of body mass, with the exception of the drug-discrimination experiment assessing 100 mg/kg JZL184, which used an injection volume of 20 μl/g of body mass. Drug treatments were randomized in all experiments. Behavioral Assessment of Nociceptive Behavior. Mechanical allodynia and thermal hyperalgesia were used to assess nociceptive behavior after sham or CCI surgery (see Discussion). Before surgery, mice were habituated to the testing environment, and then von Frey monofilaments (North Coast Medical, Morgan Hills, CA) were used to establish baseline responses to light mechanical touch and to assess the development and presence of allodynia after surgery (Murphy et al., 1999). Specifically, the mice were placed on top of a wire mesh screen, spaced 0.5 mm apart and habituated for approximately 30 minutes on 4 consecutive days. Mice were unrestrained and were singly placed under an inverted Plexiglas basket (8 cm diameter, 15 cm height), with a wire mesh top to allow for unrestricted airflow. The von Frey test uses a series of calibrated monofilaments (2.83–4.31 log stimulus intensity) applied randomly to the left and right plantar surface of the hind paw for 3 seconds. Lifting, licking, or shaking the paw was considered a response. After completion of allodynia testing, the mice were placed on a heated (52°C) enclosed Hot Plate Analgesia Meter (Columbus Instruments, Columbus, OH). The latency to jump, lick, or shake a hind paw was assessed. A 30-second cutoff time was used to avoid potential tissue damage (Garcia-Martinez et al., 2002). For each assay, testing was performed in a blinded fashion, and nociceptive behavior was assessed at 0.5, 1, 1.5, 3, 5, and 24 hours. After baseline behavioral assessment, the surgical procedure for chronic constriction of the sciatic nerve was completed as previously described (Bennett and Xie, 1988) but modified for mice (Murphy et al., 1999). In brief, the mice were anesthetized with isoflurane (induction 5% volume followed by 2.0% in oxygen), and the mid to lower back and the dorsal left thigh were shaved and cleaned with 75% ethanol. Using aseptic procedures, the sciatic nerve was carefully isolated and loosely ligated with three segments of 5-0 chromic gut sutures (Ethicon, Somerville, NJ). Sham surgery was identical to CCI surgery but without the loose nerve ligation. The overlying muscle was closed with (1) 4-0 sterile silk suture (Ethicon), and the animals recovered from anesthesia within approximately 5 minutes. Mice were randomly assigned to either CCI or sham surgical group. Mice in both groups were reassessed for allodynia and thermal hyperalgesia, as described already. Subjects were tested with drug or vehicle between 5 and 18 days after surgery. A separate group of 12 male C57BL/6J mice, trained to discriminate CP55,940 (0.1 mg/kg) from vehicle (30 minutes of pretreatment time), was used to test whether JZL184 or MJN110 would substitute for the training drug. Training and testing were conducted according to general procedures described previously (Long et al., 2009b; Walentiny et al., 2013; Ignatowska-Jankowska et al., 2014) and described in Supplemental Methods. Control tests were conducted with the training dose of the drug (0.1 mg/kg CP55,940) or vehicle. For substitution tests, MJN110 (0.25, 0.5, 1.25, 2.5) or JZL184 (4, 16, 40, or 100 mg) was administered subcutaneously 120 minutes before the test session. The JZL184 substitution assessment was conducted in two separate experiments, with the first experiment comparing vehicle versus 4, 16, and 40 mg/kg JZL184 and the second experiment comparing vehicle versus 100 mg/kg JZL184. The injections for the second JZL184 experiment were double volume (i.e., 20 μl/g of body mass). For antagonism studies, mice were injected with rimonabant (1 mg/kg i.p.) or vehicle 130 minutes before the test session. Mice were returned to their home cages after each injection and placed in the test chamber immediately before the test period. Full substitution of training drug was defined as ≥80% of responses on the aperture paired with administration of the training drug. Partial substitution was defined as 20%–79% of responses on the aperture paired with training drug, and less than 20% of responses on the aperture coupled with training drug was considered as no substitution. The percentage of responses on the “drug” aperture and the response rates were recorded for each test session. Locomotor activity was assessed in naïve mice placed individually in a clear, dimly lit Plexiglas box (42.7 × 21.0 × 20.4 cm) 120 minutes after injection of JZL184 or MJN110. Activity was monitored for 60 minutes using Anymaze (Stoelting, Wood Dale, IL) software, as described previously (Ignatowska-Jankowska et al., 2014). Distance traveled, running speed, and time spent mobile were measured. Mice were housed individually overnight. Subjects were administered vehicle or MJN110 (5 mg/kg) and 2, 4, and 24 hours later were sequentially assessed in the following three procedures: bar test (catalepsy), tail-withdrawal test, and rectal temperature. Testing was performed according to previously described procedures (Long et al., 2009b; Schlosburg et al., 2010; Ignatowska-Jankowska et al., 2014), as detailed in Supplemental Methods. Extraction and Quantification of Endocannabinoids by Liquid Chromatography–Tandem Mass Spectrometry. 2-AG, arachidonic acid, AEA, PEA, and OEA levels were quantified from the whole brains of C57BL/6J mice after acute treatment with JZL184, MJN110, or vehicle. Because each MAGL inhibitor significantly attenuated CCI-induced thermal hyperalgesia at 3 hours after injection, mice were euthanized via rapid decapitation (at 11:00 AM to 5:00 PM) at this time point. The brains were rapidly harvested, snap-frozen in dry ice, and stored at −80°C until the time of processing. Tissues were further processed according to methods described previously (Ramesh et al., 2011; Ignatowska-Jankowska et al., 2014). See Supplemental Methods for details. All data are presented as mean ± S.E.M. For allodynia testing, psychometric behavioral analysis was performed to compute the log stiffness that would have resulted in the 50% paw withdrawal rate, as previously described (Treutwein and Strasburger, 1999). Briefly, thresholds were estimated by fitting a Gaussian integral psychometric function to the observed withdrawal rates for each of the tested von Frey hairs, using a maximum-likelihood fitting method (Milligan et al., 2001; Wilkerson et al., 2012). Data were analyzed using t tests or one- or two-way analysis of variance (ANOVA). Tukey test was used for post hoc analyses of significant one-way ANOVAs. Multiple comparisons after two-way ANOVA were conducted with Bonferroni post hoc comparison. Correlations are reported as Pearson’s r values. Differences were considered significant at the level of P ≤ 0.05. Statistical analysis was performed with IBM SPSS Statistics, version 20.0 (IBM Corp., Armonk, NY). MAGL Inhibitors Reverse CCI-Induced Mechanical Allodynia and Thermal Hyperalgesia. CCI elicited significant allodynia in ipsilateral (P < 0.0001) and contralateral paws (P < 0.0001), and it also produced a significant hyperalgesic effect in the hotplate test (P < 0.0001) compared with the sham control mice (Fig. 1). JZL184 and MJN110 reversed CCI-induced bilateral mechanical allodynia in dose-related and time-dependent manners (ipsilateral paw, Fig. 1A; the complete time course of each dose is shown in Supplemental Results and Supplemental Fig. 1, A and B, for ipsilateral paw and the contralateral paw, Fig. 1B; the complete time course for each dose is shown in Supplemental Fig. 2, A and B). JZL184 produced maximal antiallodynic effects at 3 hours in ipsilateral [F(3,27) = 12.8, P < 0.0001] and contralateral [F(3,27) = 18.4, P < 0.0001] paws. MJN110 produced maximal antiallodynic effects at 1 hour in ipsilateral [F(5,41) = 16.6, P < 0.001] and contralateral [F(5,41) = 34.3, P < 0.001] paws. The respective ED50 (95% confidence limit [CL]) values for MJN110 and JZL184 at their optimal time points were 0.43 (0.30–0.63) mg/kg and 17.8 (11.6–27.4) mg/kg. The potency ratio (95% CL) for MJN110 versus JZL184 was 42.7 (24.6–82.9). Neither MAGL inhibitor altered paw withdrawal thresholds in sham mice at any time point (Supplemental Figs. 1 and 2). 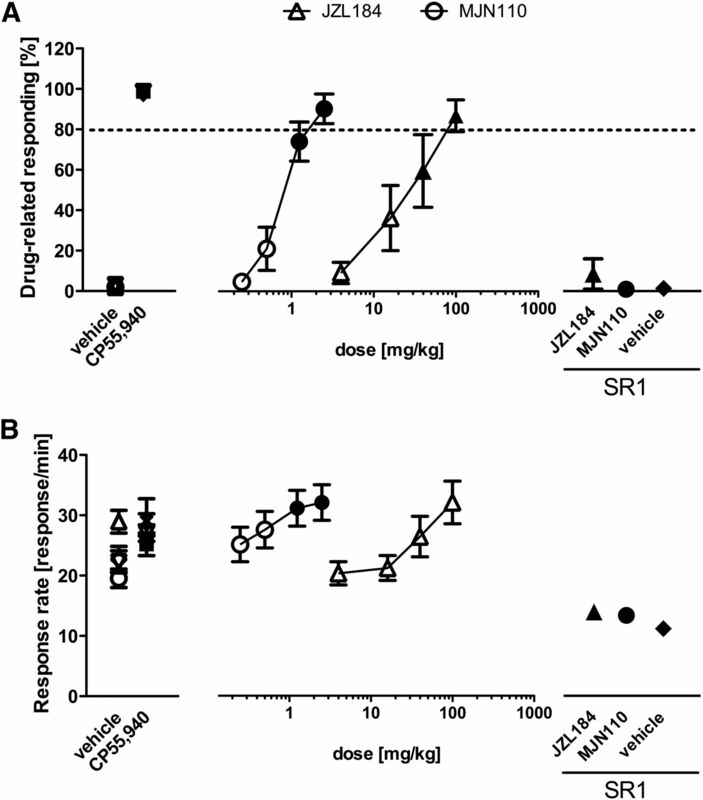 Each MAGL inhibitor significantly reversed CCI-induced thermal hyperalgesia in a dose-related and time-dependent manners (Fig. 1C; Supplemental Fig. 3, A and B). Before injection of vehicle or drug, all CCI mice displayed comparable levels of thermal hyperalgesia (P = 0.9). JZL184 [F(3,27) = 8.11, P < 0.05] and MJN110 [F(5,41) = 3.72, P < 0.05] significantly reversed thermal hyperalgesia at 3 hours. Neither drug altered hotplate latencies in sham mice (Supplemental Fig. 3). To assess the involvement of CB1 and CB2 receptors in the antiallodynic and antithermal hyperalgesic actions of JZL184 (40 mg/kg; Fig. 2, A and C; Supplemental Fig. 4A) and MJN110 (1.25 mg/kg; Fig. 2, B and D; Supplemental Fig. 4B), mice were pretreated with rimonabant (3 mg/kg) or SR144528 (3 mg/kg). JZL184 F(8,48) = 28.1; P < 0.0001] and MJN110 [F(8,48) = 8.26; P < 0.0001] significantly reversed CCI-induced allodynia. Rimonabant blocked the antiallodynic effects of each MAGL inhibitor (JZL184: P < 0.0001; MJN110: P < 0.0001). Similarly, SR144528 prevented the antiallodynic effects of each inhibitor (JZL184: P < 0.001; MJN110: P < 0.05). After allodynia testing, the mice were tested for thermal hyperalgesia in the hotplate test. Again, JZL184 [F(8,48) = 10.9; P < 0.0001] and MJN110 [F(8,48) = 24.6; P < 0.0001] produced significant antithermal hyperalgesic effects. Rimonabant significantly reduced the antihyperalgesic effects of JZL184 (P < 0.001) and MJN110 (P < 0.001). In contrast, SR144528 did not antagonize the antithermal hyperalgesic effects of JZL184 (P = 0.5) or MJN110 (P = 0.6). Rimonabant and SR144528 alone did not alter thermal responses or paw-withdrawal thresholds in sham or CCI mice at any time point. Evaluation of MAGL Inhibitors in the Drug Discrimination Paradigm. The training dose of CP55,940 fully generalized for itself, whereas control injections of vehicle did not produce any response on the CP55,940 aperture (Fig. 3A). Each MAGL inhibitor increased the respondes on the aperture associated with CP55,940 (0.1 mg/kg) but with different potencies (Fig. 3A). JZL184 [F(4,27) = 9.57, P < 0.001; ED50 (95% CL) = 24.9 (14.6–42.5) mg/kg] and MJN110 [F(4,32) = 40.3, P < 0.001; ED50 (95% CL) = 0.84 (0.69–1.02) mg/kg] fully and dose dependently substituted for CP55,940. MJN110 was 30.4 (18.9–47.6) [potency ratio (95% CL)] more potent than JZL184 in substituting for CP55,940. JZL184 did not alter response rates, but 1.25 and 2.5 mg/kg MJN110 significantly increased the response rates [F(4,32) = 10.1, P < 0.001]. Rimonabant (1 mg/kg) significantly blocked substitution of MJN110 (2.5 mg/kg) and partial substitution of JZL184 (40 mg/kg) [F(3,13) = 42.9, P < 0.0001]. Rimonabant also significantly decreased response rates regardless of inhibitor treatment [F(1,13) = 87.3, P < 0.0001]. As shown in Fig. 4, JZL184, and MJN110 differentially affected locomotor activity (see Supplemental Results and Supplemental Fig. 5 for time course data). JZL184 (16 and 40 mg/kg) produced profound decreases in the distance traveled [F(3,30) = 25.0, P < 0.0001] and the mobility time [F(3,30) = 52.8, P < 0.0001], but it did not alter running speed at any dose (P = 0.08). MJN110 significantly increased running speed [F(3,30) = 9.13, P < 0.001] and concomitantly increased the distance traveled [F(3,30) = 5.6, P < 0.01] but did not affect mobility time (P = 0.5). Significant increases in running speed were observed after 1.25 mg/kg and 2.5 mg/kg MJN110, and the distance traveled was significantly increased by 1.25 mg/kg MJN110. Assessment of Acute Cannabimimetic Effects of MJN110. MJN110 (5 mg/kg) produced a small but significant increase in the tail-withdrawal latency [F(1,11) = 5.43, P < 0.05] from 1.25 ± 0.09 seconds before injection to 3.85 ± 1.12 seconds 2 hours postinjection, when this effect was most pronounced. MJN110 did not elicit cataleptic (P = 0.4) or hypothermic (P = 0.8) effects (Supplemental Fig. 6). Evaluation of Brain Endocannabinoid levels after MAGL Inhibitor Treatment. 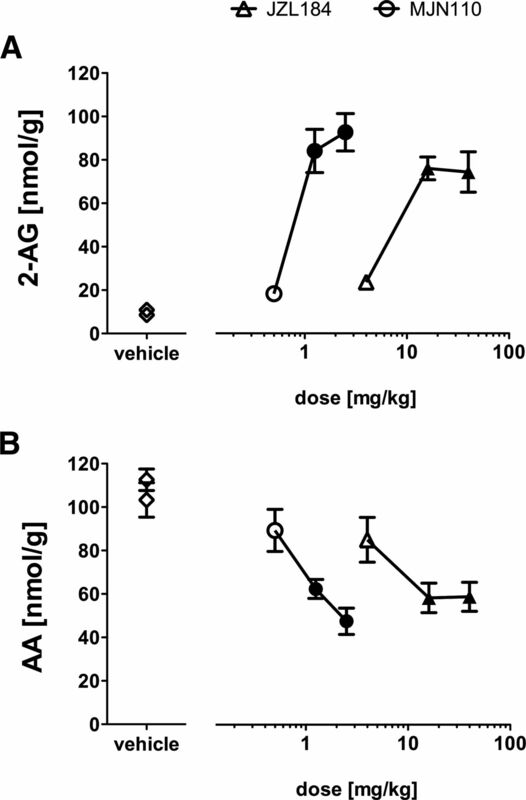 The effects of acute administration of each MAGL inhibitor on 2-AG, arachidonic acid, and AEA levels in whole brains 3 hours after drug administration are shown in Fig. 5. JZL184 [F(3,25) = 40.1, P < 0.001] and MJN110 [F(3,25) = 41.5, P < 0.001] significantly increased 2-AG brain levels. Each of these inhibitors concomitantly decreased whole-brain arachidonic acid levels [JZ184: F(3,25) = 7.9, P < 0.001; MJN110: F(3,25) = 12.4, P < 0.001]. 2-AG and arachidonic acid brains levels were negatively correlated for both JZL184 (r = −0.98, P < 0.05) and MJN110 (r = −0.97, P < 0.05). In contrast, neither of the inhibitors significantly affected brain levels of AEA, OEA, or PEA (Supplemental Fig. 7). The primary objective of the present study was to evaluate the impact of MAGL inhibition in reducing neuropathic pain versus eliciting common cannabimimetic side effects. Here, we report that two MAGL inhibitors, JZL184 and MJN110, significantly reversed mechanical allodynia and thermal hyperalgesia in the CCI model of neuropathic pain. 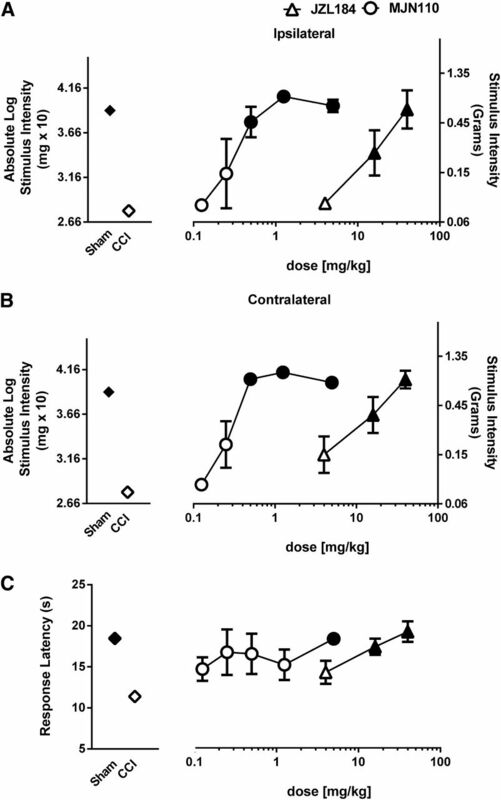 These effects were associated with elevated 2-AG and decreased free arachidonic acid in whole brains; however, these inhibitors produced differential effects on locomotor activity at doses that produced full inhibition of MAGL. Each MAGL inhibitor reversed CCI-induced bilateral allodynia and thermal hyperalgesia. MJN110 was approximately 42-fold more potent than JZL184. The onset of effects for each drug was 1 hour, but MJN110 had a longer duration of action than JZL184. Pharmacokinetic differences between these drugs may account for the quicker onset of peak antinociceptive effects of MJN110 than the maximal effects of JZL184. The antiallodynic effects of each inhibitor are likely mediated by 2-AG at cannabinoid receptors, as cannabinoid receptor antagonists blocked these antiallodynic effects. Given that 2-AG is a major source of arachidonic acid synthesis in the brain (Nomura et al., 2011), however, consequences related to reductions in this lipid may play a contributory role. For example, MAGL inhibition results in decreased levels of prostaglandins (Nomura et al., 2011), which are known to play an important role in inflammatory processes (Vane, 1971). In contrast, neither of the MAGL inhibitors increased levels AEA, PEA, or OEA in brain. In the present study, the antiallodynic effects of both JZL184 and MJN110 required activation of CB1 and CB2 receptors. Likewise, other reports have demonstrated that both cannabinoid receptors play a necessary role in the antinociceptive effects of JZL184 in neuropathic pain models (Woodhams et al., 2012; Guindon et al., 2013). The current findings demonstrating that CB2 receptors play a necessary role in the mediation of the antiallodynic effects of the MAGL inhibitors are divergent with previous mouse CCI studies from our laboratory in which the antiallodynic effects of JZL184 and KML29 (Kinsey et al., 2009, 2013; Ignatowska-Jankowska et al., 2014) were mediated by CB1 receptors, whereas CB2 receptors did not play a necessary role. A key difference in the methods used in our previous study and in our present study is the type of suture used to ligate the sciatic nerve. Previous studies used silk sutures that elicited unilateral allodynia of the nerve-injured paw (Kinsey et al., 2009, 2010, 2011, 2013), whereas in the present study, we used chromic gut suture that led to a bilateral allodynia. Reports of CCI-induced allodynia in rodents vary between unilateral and bilateral allodynia, depending on the use of silk or chromic gut suture material, respectively (Paulson et al., 2000; Milligan et al., 2006; Jancalek et al., 2010). Accordingly, the bilateral allodynia resulting from chromic gut suture may have elicited an increased inflammatory response that was ameliorated by 2-AG stimulation of CB2 receptors. Indeed, CB2 receptor stimulation has been found to reduce levels of proinflammatory cytokines and secondary signaling molecules associated with neuropathic pain, as well as increase levels of the anti-inflammatory cytokine interleukin-10 (Wilkerson et al., 2012). In contrast to the necessary role of both cannabinoid receptors in mediating the antiallodynic effects of JZL184 and MJN110, reversal of CCI-induced thermal hyperalgesia required only the CB1 receptor, whereas the CB2 receptor was dispensable. Thus, the CB2 receptor plays distinct roles in these two hallmark components of neuropathic pain, which is likely related to different mechanisms subserving the two pain modalities. Thermal hypersensitivity is mediated by lightly myelinated α-δ and myelinated C fibers, whereas mechanical allodynia is mediated by heavily myelinated α-β fibers (Woolf and Mannion, 1999; Costigan et al., 2009). A disconnect between sensory and thermal alterations in pain modalities has been previously reported in a rat model of peripheral interleukin-1β–induced allodynia and thermal hyperalgesia. In these studies, a protein kinase A inhibitor fully blocked allodynia, but it did not alter thermal hyperalgesic responses (Kim et al., 2014). Likewise, in several animal models of pain, transient receptor potential vanilloid type-1 (TRPV1) antagonists are sufficient to block or reverse thermal hyperalgesia without producing antiallodynic effects (Urano et al., 2012; Kim et al., 2014). Therefore, the underpinnings of observed behavioral measurements of allodynia and thermal hyperalgesia are complex and warrant further studies. Each MAGL inhibitor fully substituted for CP55,940 in the drug discrimination assay, which is in contrast to the effects of MAGL inhibitors in previously reported drug discrimination studies. Specifically, the selective MAGL inhibitor KML29 did not substitute for THC (Ignatowska-Jankowska et al., 2014), which indicates differences between discriminative stimulus effects of those compounds. Moreover, JZL184 only partially substituted for THC (Long et al., 2009b; Wiley et al., 2014); however, the maximum doses of JZL184 tested in these respective prior studies were 40 and 30 mg/kg. Higher doses were not assessed in those studies because of solubility constraints; however, in the present study, we found that administration of 100 mg/kg JZL184 in a double-volume suspension fully substituted for CP55,940. The finding that MJN110 was more potent than JZL184 is consistent with its lower IC50 for MAGL inhibition (Chang et al., 2012; Niphakis et al., 2013). For each inhibitor, substitution or partial substitution occurred at doses that also elicited significant increases of brain 2-AG, but not AEA, and in each case, interoceptive effects were blocked by rimonabant. Although brain endocannabinoid levels were not assessed after 100 mg/kg JZL184, these results are consistent with the notion that the CP55,940-like discriminative stimulus effects of these MAGL inhibitors were mediated by 2-AG activation of the CB1 receptor. JZL184 has previously been found to produce a subset of effects in the tetrad assay (Long et al., 2009a,b; Ignatowska-Jankowska et al., 2014), a paradigm that has been used to infer cannabimimetic activity (Little et al., 1988). It is important to note that cannabinoid receptor agonists are generally more potent in the drug-discrimination paradigm than the tetrad assay (Wiley et al., 1995a,b), which is consistent with the current study. Specifically, JZL184 produced a small increase in the tail-withdrawal latencies (Long et al., 2009a) and decreases in spontaneous locomotor activity. Likewise, here we found that MJN110 produced a low magnitude of effect in the warm-water tail-withdrawal test. Interestingly, MJN110 did not produce hypomotility, but it significantly increased running speed during the first 10 minutes of the test, which led to concomitant increases in distances traveled. Moreover, MJN110 did not produce hypothermic effects. The observations that MJN110 increased running speed are reminiscent with studies showing that low doses of THC and CP55,940 stimulate locomotor behavior (Anderson et al., 1975; Evans et al., 1976; McGregor et al., 1996). As JZL184 and MJN110 elevated 2-AG in whole brain to a similar degree, the cause of the differential effects of these drugs on locomotor activity remains an open question. One possibility is related to their off-target effects. Specifically, JZL184 inhibits FAAH, albeit with considerable less potency than its inhibition of MAGL (Long et al., 2009b). Nonetheless, acute administration of JZL184 does not lead to an increase in brain AEA levels. MJN110 also inhibits α/β-hydrolase domain 6 (ABHD6) (Niphakis et al., 2013), a serine hydrolase that is postsynpatically located and known to metabolize 2-AG (Blankman et al., 2007). Another possibility is that pharmacokinetic differences may have affected absorption and distribution of each drug. Accordingly, these drugs may have led to differential rates of 2-AG elevation in specific neural circuits that mediate locomotor activity. In conclusion, MAGL inhibitors reliably reverse nociceptive behaviors in the CCI model of neuropathic pain with reduced cannabimimetic side effects. Although both JZL184 and MJN110 produced cannabimimetic interoceptive effects in the drug discrimination paradigm, they produced opposing effects on locomotor behavior. In particular, MJN110 reversed nociceptive behavior in the CCI model of neuropathic pain with a 2-fold greater potency than required to substitute for CP55,940 in the drug discrimination paradigm, and it did not produce hypomotility, catalepsy, or hypothermia. More generally, the present study, taken together with the results of previous work (Kinsey et al., 2009, 2013; Long et al., 2009b; Schlosburg et al., 2010; Guindon et al., 2011, 2013; Ignatowska-Jankowska et al., 2014), suggests that MAGL inhibition represents a promising strategy to alleviate neuropathic pain with decreased incidence of cannabimimetic side effects. Participated in research design: Ignatowska-Jankowska, Wilkerson, Mustafa, Abdullah, Cravatt, Lichtman. Conducted experiments: Ignatowska-Jankowska, Wilkerson, Mustafa, Abdullah. Contributed new reagents or analytic tools: Niphakis, Cravatt. Performed data analysis: Ignatowska-Jankowska, Wilkerson. Wrote or contributed to the writing of the manuscript: Ignatowska-Jankowska, Wilkerson, Wiley, Cravatt, Lichtman. B.I.-J. and J. L. Wilkerson contributed equally to this work. This work was supported by the National Institutes of Health National Institute on Drug Abuse [Grants R01-DA026449, R01-DA032933, P01-DA009789, and P01-DA01725]; and a Toni Rosenberg Fellowship. (1975) Tolerance to the effect of delta9-tetrahydrocannabinol in mice on intestinal motility, temperature and locomotor activity. Psychopharmacology (Berl) 43:31–36. (2008) N-arachidonyl maleimide potentiates the pharmacological and biochemical effects of the endocannabinoid 2-arachidonylglycerol through inhibition of monoacylglycerol lipase. J Pharmacol Exp Ther 327:546–553. (2012) Highly selective inhibitors of monoacylglycerol lipase bearing a reactive group that is bioisosteric with endocannabinoid substrates. Chem Biol 19:579–588. (1976) Stimulant actions of delta9-tetrahydrocannabinol in mice. Psychopharmacology (Berl) 50:245–250. (2002) Attenuation of thermal nociception and hyperalgesia by VR1 blockers. Proc Natl Acad Sci USA 99:2374–2379. (2013) The monoacylglycerol lipase inhibitor JZL184 suppresses inflammatory pain in the mouse carrageenan model. Life Sci 92:498–505. (2011) Peripheral antinociceptive effects of inhibitors of monoacylglycerol lipase in a rat model of inflammatory pain. Br J Pharmacol 163:1464–1478. (2013) Alterations in endocannabinoid tone following chemotherapy-induced peripheral neuropathy: effects of endocannabinoid deactivation inhibitors targeting fatty-acid amide hydrolase and monoacylglycerol lipase in comparison to reference analgesics following cisplatin treatment. Pharmacol Res 67:94–109. (2005) An endocannabinoid mechanism for stress-induced analgesia. Nature 435:1108–1112. (2014) In vivo characterization of the highly selective monoacylglycerol lipase inhibitor KML29: antinociceptive activity without cannabimimetic side effects. Br J Pharmacol 171:1392–1407. (2010) Bilateral changes of TNF-alpha and IL-10 protein in the lumbar and cervical dorsal root ganglia following a unilateral chronic constriction injury of the sciatic nerve (Abstract). J Neuroinflammation 7:11. (2014) Differential regulation of peripheral IL-1β-induced mechanical allodynia and thermal hyperalgesia in rats. Pain 155:723–732. (2010) Fatty acid amide hydrolase and monoacylglycerol lipase inhibitors produce anti-allodynic effects in mice through distinct cannabinoid receptor mechanisms. J Pain 11:1420–1428. (2009) Blockade of endocannabinoid-degrading enzymes attenuates neuropathic pain. J Pharmacol Exp Ther 330:902–910. (2011) The CB2 cannabinoid receptor-selective agonist O-3223 reduces pain and inflammation without apparent cannabinoid behavioral effects. Neuropharmacology 60:244–251. (2013) Repeated low-dose administration of the monoacylglycerol lipase inhibitor JZL184 retains cannabinoid receptor type 1-mediated antinociceptive and gastroprotective effects. J Pharmacol Exp Ther 345:492–501. (1988) Pharmacology and stereoselectivity of structurally novel cannabinoids in mice. J Pharmacol Exp Ther 247:1046–1051. (2009a) Selective blockade of 2-arachidonoylglycerol hydrolysis produces cannabinoid behavioral effects. Nat Chem Biol 5:37–44. (2009c) Characterization of monoacylglycerol lipase inhibition reveals differences in central and peripheral endocannabinoid metabolism. Chem Biol 16:744–753. (2009b) Dual blockade of FAAH and MAGL identifies behavioral processes regulated by endocannabinoid crosstalk in vivo. Proc Natl Acad Sci USA 106:20270–20275. (1996) Aversive effects of the synthetic cannabinoid CP 55,940 in rats. Pharmacol Biochem Behav 53:657–664. (2001) Intrathecal HIV-1 envelope glycoprotein gp120 induces enhanced pain states mediated by spinal cord proinflammatory cytokines. J Neurosci 21:2808–2819. (2006) Repeated intrathecal injections of plasmid DNA encoding interleukin-10 produce prolonged reversal of neuropathic pain. Pain 126:294–308. (1999) Endogenous interleukin-6 contributes to hypersensitivity to cutaneous stimuli and changes in neuropeptides associated with chronic nerve constriction in mice. Eur J Neurosci 11:2243–2253. (2012) The neuropathic pain market. Nat Rev Drug Discov 11:101–102. (2013) Evaluation of NHS carbamates as a potent and selective class of endocannabinoid hydrolase inhibitors. ACS Chem Neurosci 4:1322–1332. (2000) Bilateral behavioral and regional cerebral blood flow changes during painful peripheral mononeuropathy in the rat. Pain 84:233–245. (2011) Blockade of endocannabinoid hydrolytic enzymes attenuates precipitated opioid withdrawal symptoms in mice. J Pharmacol Exp Ther 339:173–185. (2005) Characterization of the sulfhydryl-sensitive site in the enzyme responsible for hydrolysis of 2-arachidonoyl-glycerol in rat cerebellar membranes. Chem Biol 12:649–656. (2010) Chronic monoacylglycerol lipase blockade causes functional antagonism of the endocannabinoid system. Nat Neurosci 13:1113–1119. (2010) Inhibitors of monoacylglycerol lipase, fatty-acid amide hydrolase and endocannabinoid transport differentially suppress capsaicin-induced behavioral sensitization through peripheral endocannabinoid mechanisms. Pharmacol Res 62:249–258. (1999) Fitting the psychometric function. Percept Psychophys 61:87–106. (2012) Aberrant TRPV1 expression in heat hyperalgesia associated with trigeminal neuropathic pain. Int J Med Sci 9:690–697. (2007) Lack of selectivity of URB602 for 2-oleoylglycerol compared to anandamide hydrolysis in vitro. Br J Pharmacol 150:186–191. (2013) Novel 3-substituted rimonabant analogues lack Δ(9)-tetrahydrocannabinol-like abuse-related behavioural effects in mice. Br J Pharmacol 169:10–20. (1995a) Discriminative stimulus effects of anandamide in rats. Eur J Pharmacol 276:49–54. (1995b) Discriminative stimulus effects of CP 55,940 and structurally dissimilar cannabinoids in rats. Neuropharmacology 34:669–676. (2006) Evaluation of the role of the arachidonic acid cascade in anandamide’s in vivo effects in mice. Life Sci 80:24–35. (2014) Endocannabinoid contribution to Δ9-tetrahydrocannabinol discrimination in rodents. Eur J Pharmacol 737:97–105. (2012) Intrathecal cannabilactone CB(2)R agonist, AM1710, controls pathological pain and restores basal cytokine levels. Pain 153:1091–1106. (2012) Characterization of the effects of reuptake and hydrolysis inhibition on interstitial endocannabinoid levels in the brain: an in vivo microdialysis study. ACS Chem Neurosci 3:407–417. (2012) Spinal administration of the monoacylglycerol lipase inhibitor JZL184 produces robust inhibitory effects on nociceptive processing and the development of central sensitization in the rat. Br J Pharmacol 167:1609–1619. (1999) Neuropathic pain: aetiology, symptoms, mechanisms, and management. Lancet 353:1959–1964.